the assistance and hygienist very professional, explain everything she was doing. Dr. Zamora too much in a hurry couldn'teven understand what she was saying cause of the mask over her face. Maybe too many patients schedule at one time..
the assistance and hygienist very professional, explain everything she was doing. Dr. Zamora too much in a hurry couldn't even understand what she was saying cause of the mask overher face. Maybe too many patients schedule at one time.. I really enjoy this office. It doesn't seem like I'm going to the Dentist, but visiting old friends. In fact thisis only my second visit. What more can I say. Since her earliest memories, the profession of dentistry has meant service for Dr. Zamora. Becoming a dentist is all she has wanted to do, and she loves being a dentist. Making a positive difference in peoples’ lives is unbelievably rewarding for Dr. Zamora, because she knows that smiles build confidence and change lives. It is a privilege for her to serve people and she strives to provide personalized, quality, and compassionate care to each and every patient while creating beautiful, healthy smiles for life. She is committed to providing her patients quality, timely dental care in a caring, relaxed environment using the best that technology and health care is available. I enjoyed my first visit very much. Everyone was so nice. Very knowledgeable staff & doctor. I’m very expressed. Very thorough exam. Tks so much. First time there, staff was very nice, I was not nervous! it was a very pleasant experience. Loved Dr. Zamora, loved the hygienist ~Friendly, clean office! Wow! First trip to the new office. It’s so nice. Zam has always been great even when they were in the small office and this just makes it better. They even have TVs in the ceiling to watch while you getyour cleaning done! I sat back and was like what?! We aren’t going anywhere but they still make it better each time. Don’t forget to get the chapstick on your way out! I was very pleased with Dr Zamora and I highly recommend her. I had a filling repaired and a cleaning. I didn't even feel the shot for the filling and I was numb almost instantly. I haven't had that from previous dentists. Dr Zamora and her staff were great! Love her very pleasant Doctor. Very comfortable atmosphere. Dr. Zamora and her staff were caring and extremely professional in every respect. The exam was carefully done in a comprehensive manner. I was experiencing molar tooth pain, and an extraction was done with minimal discomfort. I was able to getan active treatment plan, with costs shown which were covered by insurance, and those not covered by insurance. This information gave me an opportunity to select what treatment is needed and budget the treatment. No pressure at all. I very highly recommend Dr. Zamora and her staff. I am a senior, and this dental treatment was far better than I have received in past decades. Visit was great like always. Do understanding. As soon as I walked in, I was greeted by the very sweet lady in front. I had an appointment at 2 o’clock, and was saw right away at 2. Everyone in the office was very friendly to me, as ifI was already a regular there! The dentist assistant and Dr. Zam answered all the questions I had regarding my insurance and future dental treatments :) This was my first time here, and this will be my new dentist for now on! She is fantastic. Very good at explaining everything she is doing. Takes time to explain. Could not ask for a better dentist. My husband had not let anyone but Dr. Egbert touch his mouth since he was a young man. I was concerned when Dr Zamora assumed the practice. but even my husband loves Dr. Zamora! She is Very professional & knowledgeable while personable. We love her! Dr Zamora and her staff are the best. Always get me in quickly and customer service is second to none. Dr Zamora is very thorough and makes you feel relaxed at the same time. Highly recommend! We've been going to Dr. Zamora since she started her practice here, and she has been fantastic. Dr. Zamora and her staff are very friendly and organized. The office is clean, they provide regular reminders and updates, and we have notexperienced any billing issues. We would recommend Dr. Zamora to anyone. Overall visit was very good. Everybody was very professional, office was clean and inviting. The only 1 thing I would like to change is the ex-ray equipment which made it very uncomfortable to take pictures of my teeth. Even though thetechnician was very good and patient with me, taking pictures of my teeth was not a good experience at all. Very Leary of dentist in general. Dr. Zamora put me at ease immediately from the moment Martin the D.A took me into the exam room I felt very at ease. Everyone in the office is very professional and kind. I will recommend ZAM Dental wholehearted. Like most adults I have that fear of going to the dentist but I realized if I was going to get my health back in order i needed to start at the beginning. My boyfriend was the first to visit thisoffice and when he told me how great it was I knew I had to go. I used the ZOC-DOC app and it was a breeze. Dr.Zamora is really great she will tell you what needs to be done right away and get your smile back in order. The atmosphere and people in the office are both so inviting as well. This was my first visit to Dr Zamora's office. I was met with a cheerful greeting from Emily and taken care of right away. The staff at Dr Zamora's office was very friendly and efficient. Dr Zamora herself was also veryfriendly and caring. She explained everything to me so that I understood and was comfortable with the information. She did not rush me through the appointment and actually went out of her way to treat me during my appointment. Dr. Zamora and her staff are caring and professional/ knowledgeable. They are always on time and pleasant. Dr. Zamora is always concerned with keeping your pain/anxiety level low and your comfort level high ,she is a gifted dentist. Highly recommended. I think she is awesome!! As always my wife and I had a good experience. The professional attitude and the caring of both staff and Dr. Zamora were readily apparent. I would highly recommend Zam Dental. I highly recommend Dr.Zamora. There was no wait time at all & the tooth cleaning was fast! Very thorough dentist who checks your thyroid, blood pressure, and oral cancer. We love going to Dr. Zamora. The staff is friendly and helpful. Dr. Zamora explains procedures clearly. Wonderful bedside manner! I highly recommend ZamDental! 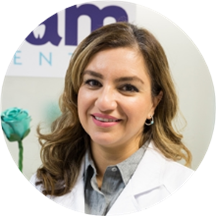 Dr. Zam and her staff are inviting, caring, entertaining, and professional! A visit to the dentist office with Melody and company is a treat! I used to hate going to the dentist but now I never worry when I go to Melody Zamora,DMD. I have recommended her to other family members and friends. She is fantastic.